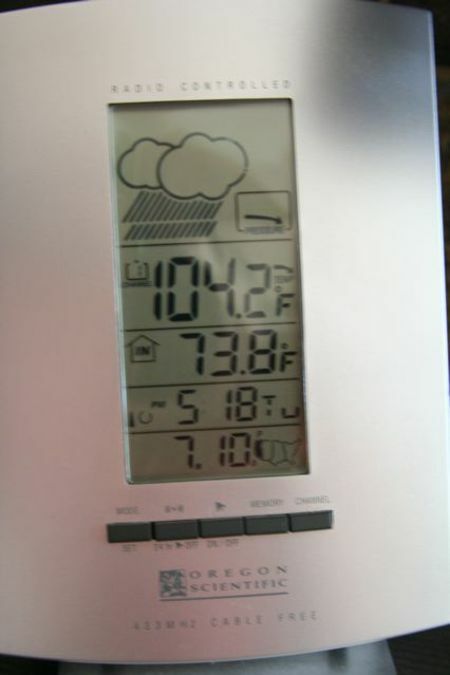 My thermometer is reading 104! That is hot for the Pacific NW - it has also been windy, so instead of baking, we are in a convection oven. I know this is nothing like being in AZ right now but we are not used to this. And for some reason this weather is making me hungry - I have been eating non stop all day. Which is not good. Efficient usage of space having a corner desk - allows for lots of working space and the screen to sit far enough back. Expensive - especially the shipping, so if you can ship to store and pick up that is a much better deal. Top file drawers open all the way BUT Pottery Barn did not take into consideration the overhang of the desk top by two inches. It is very difficult to get files in and out. The finish on this furniture is nice but it will not stand up to rough use, children or dogs. I already have dings and scratches that won't come out. And I refuse to buy the plexiglass desk cover at PB for $329 - I am on the hunt for a fun desk blotter, but have yet to find one. Before buying this desk set I looked at IKEA, Dania and OfficeMax. While they all had parts of the solution, Pottery Barn had the only total solution. Check out the album for my pictures! Daily Grind: So like I said above I have been eating all day...some good things and some not so good things. I did go to my first yoga class today. Found out that I really need to work on my core muscles so I can at least balance without looking like a drunken flamingo! But I did like it and will go to another class tomorrow morning.